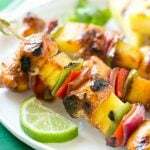 This recipe for Hawaiian chicken kabobs is juicy chicken breast, pineapple and vegetables in a sweet and tangy sauce, threaded onto skewers and grilled to perfection. Serve with coconut rice for a taste of the tropics at home! There’s just something about the combination of chicken and pineapple that I love – I think it’s that savory-sweet thing that works so well with so many different ingredients. 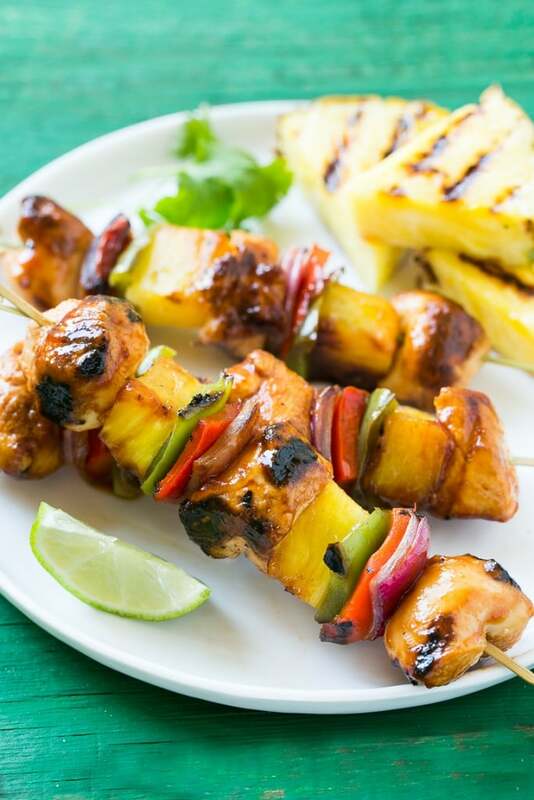 These Hawaiian chicken kabobs combine chicken and pineapple with lots of vegetables and an amazingly delicious marinade for a dinner that will make you feel like you’re on vacation. How do you make Hawaiian chicken kabobs? The base of this recipe is a marinade that packs tons of flavor with soy sauce, pineapple juice, fresh ginger and a lot of other great ingredients. The chicken needs to marinate for at least an hour, so plan accordingly. After the chicken comes out of the marinade it gets threaded onto skewers with pineapple, red and green bell peppers and red onions. Throw the skewers on the grill, baste them with reserved marinade and dinner is served! 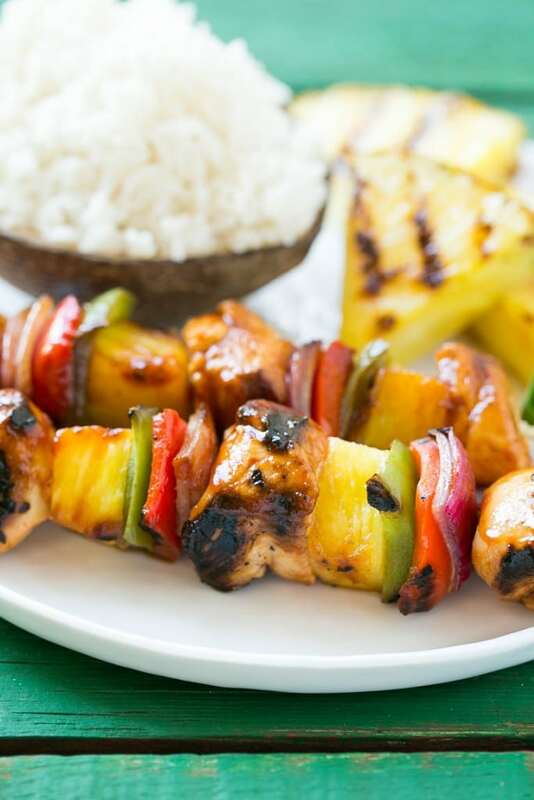 I like to serve these Hawaiian chicken kabobs with a side of coconut rice to complete the tropical theme. You can use fresh or canned pineapple in this recipe, if you go with fresh, it’s also fun to throw some wedges of pineapple on the grill to serve as a complement to the meal. 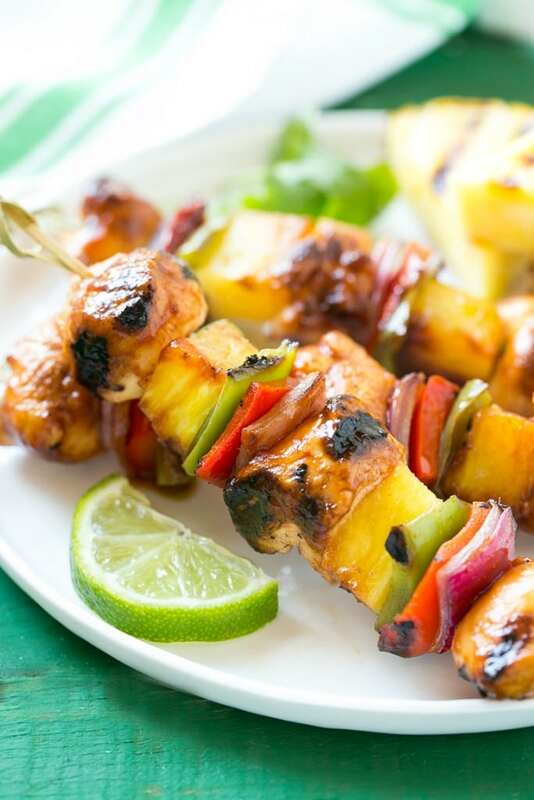 These Hawaiian chicken kabobs would make the perfect entree for a summer party, or just for when it’s cold and raining out and you want to pretend like you’re on a beach somewhere sunny. I’m not waiting for warmer weather to make them, I’ve got this recipe on my menu plan again for next week! In a medium bowl combine the ketchup, brown sugar, soy sauce, pineapple juice, rice vinegar, ginger and sesame oil. Season to taste with salt and pepper. Place the chicken in a large resealable bag and pour half of the over the chicken; reserve the remaining marinade in the refrigerator. Marinate the chicken for at least 1 hour or up to 4 hours. Soak 4 long bamboo skewers in cold water for 20 minutes. 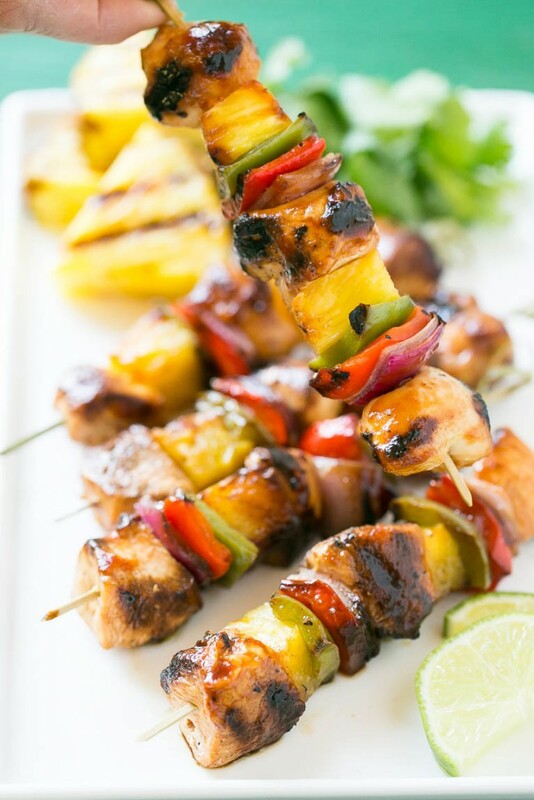 Thread the chicken, pineapple, bell peppers and red onion alternately onto the skewers. Drizzle the skewers with the olive oil and season with salt and pepper. Grill for 5 minutes on each side. Brush the marinade all over each kabob and grill for one minute more on each side. Serve immediately, garnish with cilantro and lime wedges if desired. That chicken looks great! I also love grilled pineapple. I think I need that pineapple slicer, what a cool tool! Looks wonderful and easy! Going to try it Sunday night for my family dinner! Oh wow, these look amazing! SO much flavor! I’m a huge fan of the sweet/savory flavor combo, and that marinade sounds incredibly flavorful! I love the pairing with coconut rice too. Perfect! I love chicken kabobs and this marinade sounds fantastic! Sweet savory and tangy Chicken kabobs! count me in…it’s my fave and you made them absolutely delicious looking dish. Perfect!!! Totally a chicken recipe I KNOW I would love! 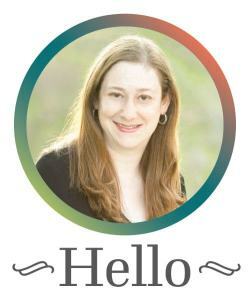 The sweet tangy stickness…yes!